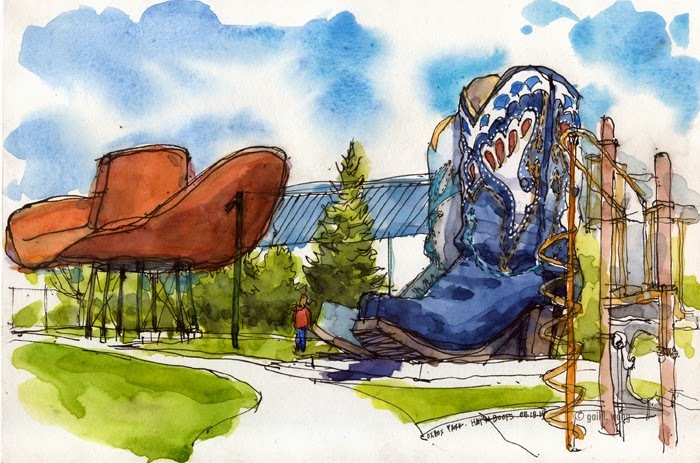 I have always wanted to sketch the Hat 'n Boots and remember driving by it when it was at its original location. I don't think it was a working gas station at that time. I'm glad they saved this 1953 icon. There was only one spot in the whole park where I could get both the Hat and the Boots in the same view. From most other points in the park they were either too far apart or you couldn't see the two boots and the hat together. Here is the sketch I did and a photo of the park with my set up in the foreground. Beautiful Gail. Nice job on the details on the boots! Yours turned out turned out great as well. Nice to see it from different perspectives.